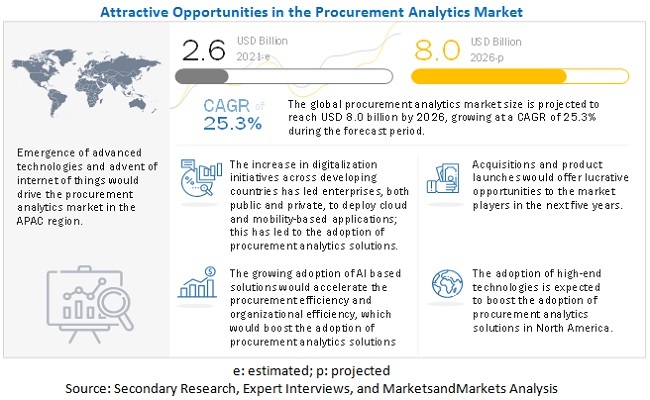 [139 Pages Report] The global procurement analytics market size is expected to grow from USD 1.6 billion in 2018 to USD 4.1 billion by 2023, at a Compound Annual Growth Rate (CAGR) of 20.4% during the forecast period. The increasing focus on enhancing procurement channels’ operational efficiencies, an imminent need to handle compliance polices and contracts, organizations’ struggle to sustain their position in the competitive environment are main drivers for the procurement analytics market. The market for services segment is growing as individuals, Small and Medium-sized Enterprises (SMEs), and large enterprises are adopting services to enhance their productivity. 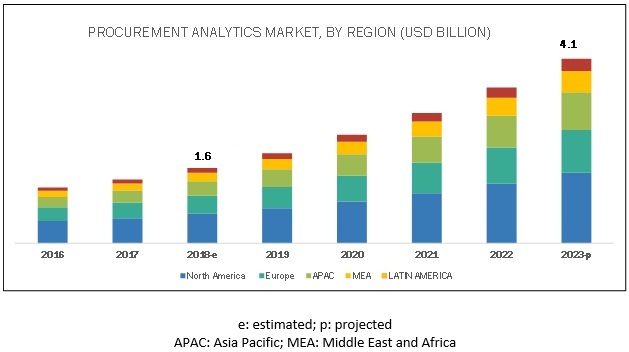 The procurement analytics market study aims at estimating the market size and future growth potential of the market across segments, namely components (solutions and services), application areas, deployment types, organization sizes, verticals, and regions. The demand for procurement analytics solutions is rising, as organizations are looking for solutions to comply with stringent regulations related to their accounts and procurement data, increasing adoption of market intelligence by suppliers, and the necessity to keep company’s expenditure to the minimum without affecting its operations. The management of SMEs are concerned about the expenditures of deploying on-premises procurement analytics solutions and contracting skilled staff, and IT teams for their maintenance. To overcome these issues, SMEs are leaning toward cloud-based solutions. The industry players are also making efforts to improve their profit margins and increase their market share by either introducing dedicated cloud platforms or associating with other cloud service organizations. The procurement analytics solutions and services have been deployed across industry verticals, including retail and eCommerce, manufacturing, government and defense, healthcare and life sciences, telecom and IT, energy and utilities, Banking, Financial Services, and Insurance (BFSI), and others. The retail and eCommerce vertical is expected to grow at the highest CAGR during the forecast period, while the telecom and IT vertical is estimated to have the largest market size in 2018. The global market has been segmented on the basis of regions into North America, Europe, APAC, MEA, and Latin America to provide a region-specific analysis in the report. The North American region, followed by Europe, is expected to become the largest revenue-generating region for procurement analytics solution and service vendors in 2018. Increasing Internet of Things (IoT), cloud adoption, and need for supply chain and demand intelligence trend are some of the key factors expected to fuel the growth of the procurement analytics market in North America. The APAC market is gaining traction, as the demand for predictive analytics is increasing in developed and developing nations in APAC. SMEs as well as large scale organizations in the APAC region are highly relying on procurement analytics for vendor management, contract management, risk management, and spend analysis. Major vendors offering procurement analytics services across the globe include SAP (Germany), Oracle (US), SAS (US), IBM (US, Coupa Software (US), Zycus(US), BRIDGEi2i Analytics (India), JAGGAER (US), Rosslyn Data Technologies (England), Genpact (UK), Tamr (US), Simfoni (US), BirchStreet (US), Proactis (UK), and Sievo (Finland). 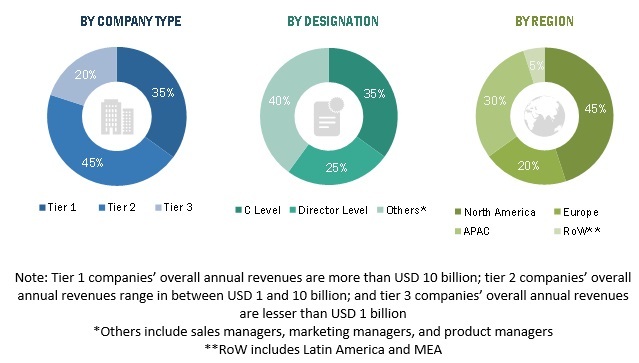 These vendors have adopted various types of organic and inorganic growth strategies, such as new product launches, partnerships and collaborations, and acquisitions, to expand their offerings in the procurement analytics market. Oracle is one of the leading vendors in the world’s largest global procurement analytics market. The company provides solutions for procurement, strategic sourcing, and spend management. The company provides end-to-end insight into the spend patterns and visibility across the procurement processes which can significantly reduce costs, enhance profitability, increase customer satisfaction, and gain a competitive advantage for the organizations. It plans to develop new business models and integrate multi-application solutions as a part of its future strategy. Similarly, SAP, another leading procurement analytics solutions provider, has implemented various strategies to deliver cutting-edge procurement analytics to global organizations. Various organic and inorganic growth strategies are helping the procurement analytics vendors to stay ahead in the global market. In February 2019, Barclay Commercial Payments, part of Barclays Bank PLC partnered with SAP UK Limited to integrate its B2B payment product, Precisionpay, into SAP Ariba solutions. This integration would give Ariba Network users seamless end-to-end procurement experience by integrating procurement and payment solutions. In February 2019, Munich Re, a Germany-based reinsurance, primary insurance, and insurance-related risk solutions provider, partnered with Coupa Software to implement source-to-pay solution for its procurement and related spend management processes. In September 2017, SAS launched Procurement Integrity solution to combat procurement fraud and related losses by improving the efficiency of the procurement processes including the spend management and supply chain. The new solution integrates with major Enterprise Resource Planning (ERP) platforms for optimizing the procurement processes. * Business Overview, Solutions Offered, Recent Developments, SWOT Analysis, and MnM View Might Not Be Captured in Case of Unlisted Companies. The study involved 4 major activities in estimating the current market size of the procurement analytics market. Exhaustive secondary research was done to collect information on the market, peer market, and parent market. The next step was to validate these findings, assumptions, and sizing with industry experts across the value chain through primary research. Both top-down and bottom-up approaches were employed to estimate the complete market size. Thereafter, the market breakup and data triangulation procedures were used to estimate the market size of the market’s segments and subsegments. In the secondary research process, various secondary sources, such as D&B Hoovers, Bloomberg BusinessWeek, and Factiva, have been referred to, for identifying and collecting information for this study. These secondary sources included annual reports; press releases and investor presentations of companies; whitepapers, certified publications, and articles by recognized authors; gold standard and silver standard websites; security technologies Research and Development (R&D) organizations; regulatory bodies; and databases. Various primary sources from both supply and demand sides of the procurement analytics market ecosystem were interviewed to obtain qualitative and quantitative information for this study. The primary sources from the supply side included industry experts, such as Chief Executive Officers (CEOs), Vice Presidents (VPs), marketing directors, technology and innovation directors, related key executives from various vendors who provide the procurement analytics solutions, associated services, and technology integrators operating in the targeted regions. All parameters that affect the market covered in this research study have been accounted for, viewed in extensive detail, verified through primary research, and analyzed to get the final quantitative and qualitative data. The key players in the market were identified through extensive secondary research. The market size, in terms of value, was determined with the help of the primary and secondary research processes. All percentage shares, splits, and segment breakups were determined using secondary sources and verified through primary sources. This research report categorizes the procurement analytics market based on component, application area, organization size, deployment mode, vertical, and region.